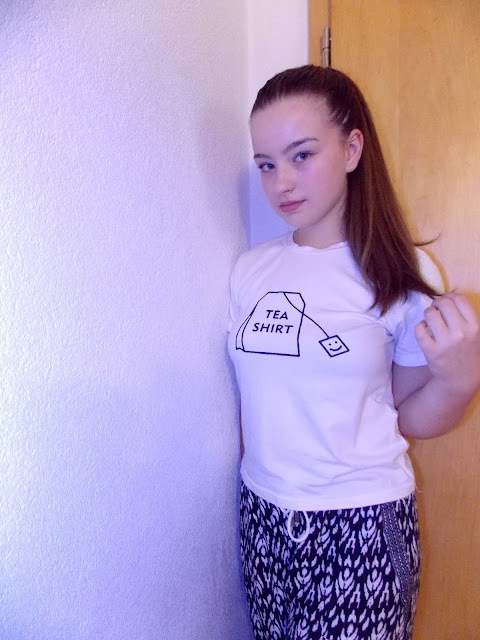 Grabbing my cup of tea and writing about my ''tea shirt'' from Zaful, such a lovely evening! When I saw this shirt on some other web shops before, I knew I needed to have and I was hoping I would find it on Zaful. And soon I did and I was so excited when I ordered it, just hoping it would fit me nicely and that the material would be nice. Did I get what I wanted from this T-shirt? How much does it cost and where you can get it? Keep reading! So, I always like to discuss the material in my reviews of clothes because I think it's really important for clothes to have nice materials you feel comfortable in. This T-shirt has a really nice material,mixture of cotton and polyester and I think it can be a Summer clothing item as well as shirt for some colder days with a cardigan over it. The material is not to thick but still isn't too thin or see-through. I hope I have explained that good. The sleeves are classical length. I ordered it in size M which fits US 6 and I really how it fits me. It's not too long so you can wear it with high-waisted pants but still not too short that it couldn't be worn with regular waist jeans. The print is nicely done, it doesn't fade away and I really love the saying tea shirt because I am a huge tea lover! For all of my tea lovers out there, I would recommend getting this lovely T-shirt from Zaful, I have nothing bad to say about it, I absolutely love it! Thank you so much for reading! I hope you have enjoyed this post and if you did, be sure to let me know down below and tell me do you prefer tea over coffee or vice versa? Drago mi je da ti se dopada, hvala! Hvala ti puno na komentaru! Hvala puno draga moja Petra! Oh I love it! Simple and catchy! Glad you like it, thanks for your comment! Majica je preslatka i super ti stoji. The shirt is simple and it compliments your beauty! Majica je jako lepa, sva je u tumblr stilu. A tebi stoji predobro. Majica je jako lepa i super ti stoji!